While there has been no shortage of leaks around the Galaxy S10 and Galaxy S10 Plus, images of the all-new more affordable Galaxy S10e have been comparatively thin on the ground. Thankfully, that has now changed. Several images of the entry-level Galaxy S model have surfaced online, where they were spotted by Samsung-centric technology blog SamMobile. Unlike the pricier Galaxy S10 and S10 Plus models, the S10e will shun the dual-curved screen in favour of a flat Infinity-O panel. This is likely a cost-cutting measure. The handset in the blurred paparazzi-style images is covered in security watermarks, which suggests that this is the real deal. After all, it seems like a strange detail to add to a fake image, although, as always, it's worth taking these leaks with a healthy pinch of scepticism. If the leaked photos are accurate, we can expect the Samsung Galaxy S10e to have a smaller display than its costlier counterparts – 5.8-inch compared to 6.2-inch, and 6.4-inch for the Galaxy S10 and Galaxy S10 Plus, respectively. The circular cut-out in the display used to house the front-facing camera is 0.5mm, which is pretty much identical to the one on the Galaxy A8s. The as-yet unannounced smartphone appears to be running Samsung's new One UI operating system, which is based on Android 9.0 Pie. The new software has been redesigned from the ground-up to make it easier to use one-handed – despite the ever-increasing screen sizes of modern smartphones. Based on the loading screen photographed in one of the images, the more affordable entry in the new Galaxy S range will be branded Galaxy S10e. The phone, which is rumoured to cost £669 when it launches, will be powered by the same flagship processor as the other models in the range, albeit with a smaller 6GB of RAM and 128GB internal storage. 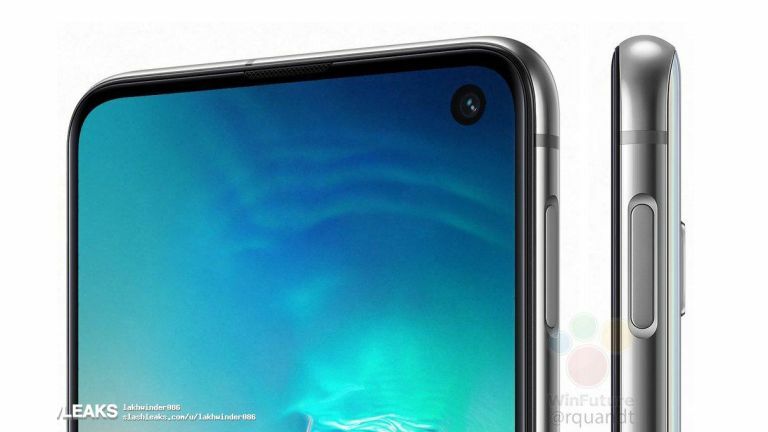 Galaxy S10e will also have a dual-camera system on the back – not the triple-camera widely-tipped to be coming to the other, pricier models. According to SamMobile, the so-called PowerShare reverse wireless charging feature will not be present either. Galaxy S10e will be available in Black, Green, White and Canary Yellow colour options. Samsung will hold its annual Galaxy Unpacked event to unveil the new hardware on February 20, 2019. T3 will be in the audience and will have all the latest news from the event as soon as it breaks. So stay tuned.